The stair formwork from an actual job that I did in 2004. 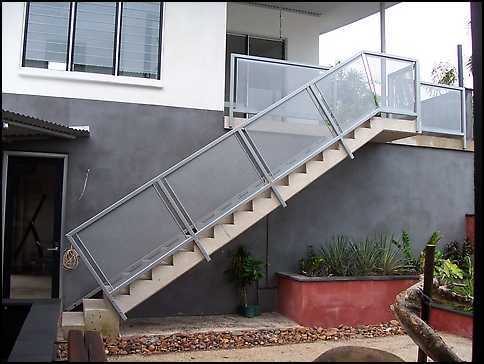 A couple of flights of outdoor concrete stairs, up to two first floor apartments. I didn't take any photos at the time, but here is a detail off the drawing, showing the rebar etc. Stair formwork - Actual detail lifted of the drawing, for the flight of stairs below. As with all stair formwork, indeed all stairs in general, you can see the toe space. The stair is supported by the landing at the top, which is in turn a continuation of the main floor slab. The stair and landing were poured at the same time as the main floor slab. The throat is the thickness of the stair slab that holds up the stair. The tread triangles above it are just dead weight as far the the structural engineer is concerned. It is critical to get the throat or slab as it is sometimes called, right. The reinforcing bars are placed in the bottom of the slab with the correct amount of cover as detailed by the engineer. The N12 and N16 refers to the type and size of the bar. In this case it is a general purpose deformed bar with a yield stress of 500 MPa. SL92 refers to the type of reinforcing mesh to the top of the slab. N32 refers to the strength of the concrete. These are just brief details that give the guys on the job what materials to use. In another part of the drawing references are made to the various Australian Standards that govern various parts of the work. For example there is a standards for concrete, for rebar, for formwork, there are sections in the BCA governing stairs, handrails etc. There is a section on the concrete cover to the rebar steel. That is the position of the rebar in from the surface of the concrete. Stair formwork - The completed stair, this straight is the maximum allowed number of steps in one flight, any more and it would have to have a landing in the middle. Here is one of the almost finished flights of stairs. The handrail system was all aluminium, with perforated aluminium panels. The fixing was masonry anchors to the edge of the concrete stairs and landings. For small one off jobs like this, a mixture of the old and the newer methods of formwork is mostly used. A mixture of steel props and maybe steel "h" frames under the landing, and good old form ply and timber struts and braces. 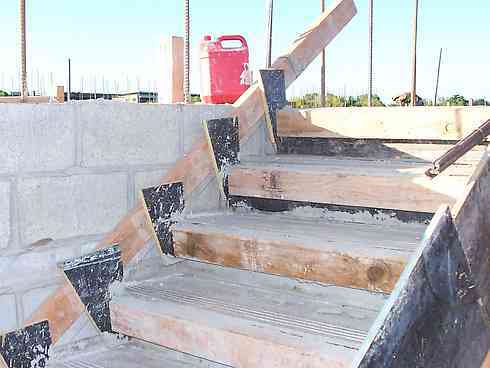 Stair formwork - Stairs with a half space landing. Here's a photo of a set of stairs with a half space landing. Note that the soffit (underneath side) ply and supports of the landing run through wider than necessary for just the concrete, to support the timbers for the upper flight of the stair. You can see that all the smaller supports are cut out of timber, while where possible the steel "Acrow" props have been used. Here you can on the top of the same concrete stair, that there is no form against the wall. The concrete touches the core filled blockwork. Instead of a side shutter they shoot a timber to the wall with a "Ramset" gun (powder actuated fastener} and the risers, that are ply with a 100 x 75 timber fixed to them, are attached to the wall timber with ply cleats. The right hand side shutter has had it's timbers and braces back to the wall removed so that people can start using the stairs. The formwork will stay in place at least a week. A basic principle of stair formwork is that the treads are not formed, but left open. A normal good quality concrete mix with a standard slump, (that is not too wet) will well up slightly under vibration, but it should not pour out of the bottom in a flood. As you can see here, the treads have already been partly finished. In the photo above, you can the setup used when the stairs are wider, using more than one Strongback. There are two strong backs supporting the riser timbers. There is no limit as to how many and how wide the stair can go. Notice at the top the carpenter has put in an additional 150 x 100 timber bearer to support the strong backs. The risers are hanging off the strong backs with vertical timber hangers. (to hold them up, straight and level. 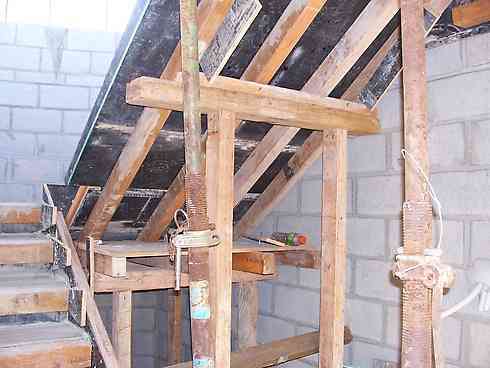 These timber hangers and braces off the Strongback are alternated, each side of the heavier timber, to stop any tendency for the timber to twist sideways. The foot of the strong backs are braced against the already poured concrete paving. The side forms are braced at the bottom and top to a heavy timber plate that is supported by steel pickets in the ground. Note the edge formwork for the landing walkway slab bolted to the walls. It is going to be poured with the stairs.